Palestinian Authority says Jewish worship in vicinity of Temple Mount is unacceptable, vows to continue to pay terrorists. The Palestinian Authority (PA) has condemned Israel for allowing Jews to worship in the vicinity of the Temple Mount. 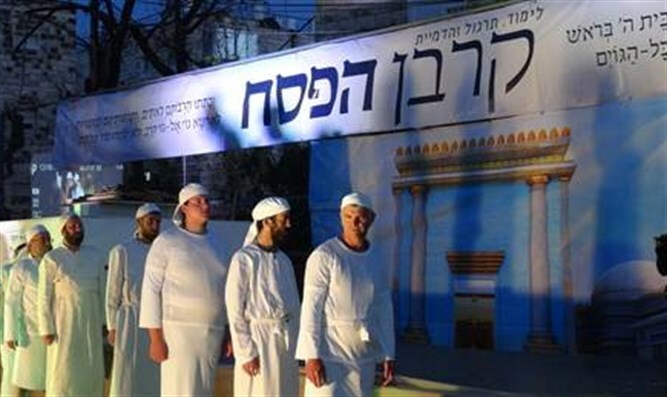 Following a meeting in Ramallah, the PA released a statement condemning the decision to allow a group of Jewish worshipers to reenact the bringing of the 'Korban Pesach,' of Passover Offering, near the Temple Mount, which is the holiest site in Judaism. The PA called allowing the performance of the rite a "dangerous precedent." Jews and other non-Muslims are prohibited from praying or engaging in any religious activity on the Temple Mount itself by the Muslim Waqf which administers the site. The PA also condemned the eight month prison sentence given to Ahed Tamimi, the Arab teenager who was filmed striking IDF soldiers, and the US Congress for passing the Taylor Force Act, which cuts off financial aid to the PA as long as the PA continues to pay salaries to convicted terrorists and their families.